The grade-by-forum and grade-by-topic functionality in Discussions & PM meets the majority of instructors’ grading of discussions needs. However, there are two other use cases that are best addressed with the new grade-by-category functionality. 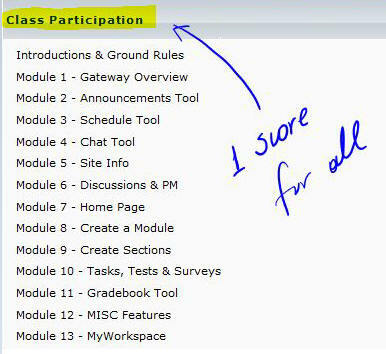 Set one grade for “class participation” for the whole term. To enable grading for a category, click on Manage >> Click on Manage Categories >> Click on the title of the Category that you want to edit. 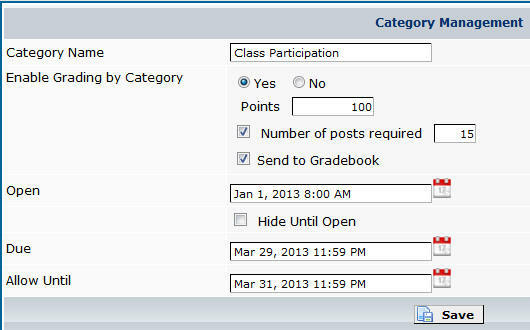 Set the title for your category, choose ‘yes’ to enable grading, add your points and check ‘send to gradebook. Add dates and posts required, as desired. Click on Save to accept your changes. Again, this setup is for when you want to give one score to students for all of their contributions (topics and replies) ACROSS all the forums under the category. Send one entry to the gradebook per group assignment (not one per group forum). Below is an example as to how you would set up grade-by-category to handle grading private groups or sections. First, enable grading for a category. Click on Manage >> Manage Categories >> Click on the title of the Category. 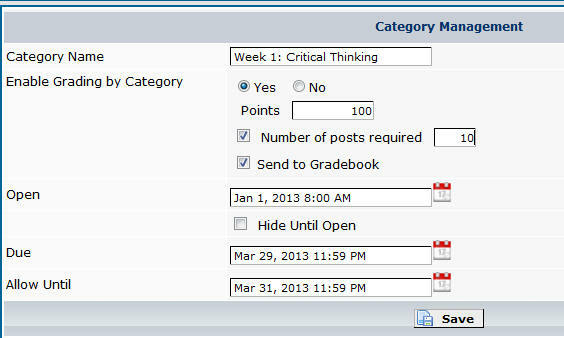 Enable grading, set your points and minimum number of posts required, and check ‘send to gradebook’. Set dates, if desired. You may set the scores to go to the gradebook later, from the “Grade Category” link located in the Discussion Home. Now that you have set up your category, you are ready to create forums UNDER it. While still under “Manage” click on Manage Forums at the top. Set up forums for each group or section, and place them under gradable categories, as in the example below. To make your forums private (by section or group), go to Manage >> Manage Forums >> Click on the title of the forum, and set group access to each forum. Check “Allow Access to Selected Groups” to choose the right group / section. You can grade your students’ contributions in context, by clicking on ‘grade’ on each student’s post, adding more points to the previous score every time you evaluate additional contributions. Additionally, you can click on “Grade Category” from the main Discussion List. From there, you can see the total count and view ALL of a student’s posts across the forums of that category – all in one page. The title of the category is what will be sent to the gradebook. Each student will see the title of the category there. In our example, they would see the highlighted category titles below will be sent to the gradebook. Not the forum titles.